Our friends at Grupo G.A.B.I.E. 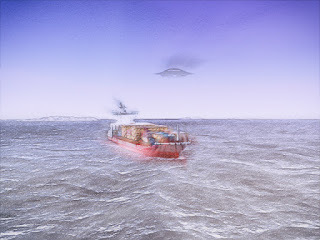 have submitted another fascinating account of strange events in Argentina – this time involving a electromagnetic phenomenon that could be construed as a CE-2 were it not for the absence of any discernible unidentified object or anomaly. Suffice it to say that Patagonia has always been a prime locale for high strangeness events and this is clearly one of them. In spite of his injuries, he was able to acquire a vehichle in neighboring Chile that was customized to his needs, allowing him to get around. During a particular morning in 1998 (date given as 07.13) Mr. Ocampo boarded his vehicle to head to his business. It was around seven o’clock in the morning when he drove along a snow-covered road, lined by many trees native to the area. He remembers listening to a local station when it dawned on him that he had forgotten his eyeglasses back home. He turned around and embarked upon the return journey – a distance of approximately 15 blocks – along open snow fields at the edge of the Olivia River. He tried starting the car repeatedly, wondering what was going on, until he finally succeded. The radio died again, but the car remained in motion – only its driver had no control over the vehicle. The brakes and steering were inoperable, and it wasn’t long before the vehicle left the road, as if guided by an invisible force. It plowed through a snowfield until it came to rest before a stand of cypress trees. Ocampo experienced injuries as a result of this and was rescued by a passing motorist. His car was eventually pulled out by a tow truck. Publicado por Terra Incognita en 9:03 p. m.